A majority of Americans - 57% - say they believe in psychic phenomena such as ESP (Extra Sensory Perception), telepathy or experiences that can’t be explained by normal means. Just over a third, however, do not think such phenomena occur. But the number of believers has declined somewhat over the years. In 1989, when CBS News last polled on the subject, 64% of the public said they believed in psychic phenomena; 26% said they did not. There are some demographic differences. Americans age 65 and over are most skeptical about ESP, telepathy and other like experiences. Those age 65 and over do not believe in the paranormal by 47% to 32%. 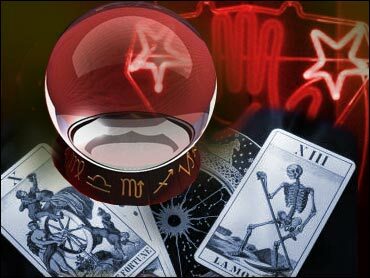 By 62% to 31%, those under 65 think psychic phenomena take place. Religion plays a role in people’s opinions about psychic phenomena. Two-thirds of those who identify themselves as Catholic say that psychic phenomena occur, compared to only 52% of Protestants and other religions. Interestingly, there are some differences with regard to education. By 60% to 54%, those with at least some college education are slightly more likely to say psychic phenomena occur than are those with less education. While a majority of the public believes psychic phenomena take place, only a small number say they have actually had a psychic experience. Eight in 10 have never had such an encounter, and 16% say they have. Back in 1989, a quarter of Americans admitted to an experience with psychic phenomena. Ever Experience Telepathy Or ESP? Even though an equal number of men and women think psychic phenomena happen (57%), more women than men say they have experienced phenomena such as telepathy or ESP. 20% of women admit to having an experience compared to 13% of men. There are differences when it comes to age as well. Those between the ages of 45-64 are the age group most likely to say they’ve had a psychic encounter (21%). Just 11% of Americans under 30 likely to say they’ve had a psychic experience. Also, adults who think psychic phenomena occur are more likely to admit they’ve had a psychic experience. 26% of believers say the have had an experience, compared to only 4% of non-believers.